TAMIYA 16004 ‘R’ HONDA CB750 POLICE TYPE 1/6 scale model kit! Huge 1/6 scale of the Honda CB750 ‘Shiro Bai’ (white bike) as used by the Japanese police force. 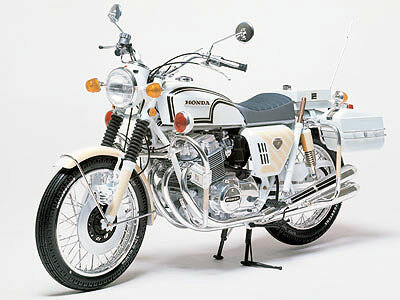 The police issue CB750 is slightly larger and heavier than the market version; despite this, its performance nearly matches that of the market version of the CB750. This kit is made primarily of injection plastic, with rubber tires and shocks (the front and rear suspension detail is excellent), metal springs, rods, and other detail, and several chrome-plated pieces.